African Fusion is a Natural material. African Fusion is a High priced Quartzite stone. African Fusion is mostly black with swirls of gold, cream and white running through it. This material looks stunning on a kitchen island as a centre piece and suits both traditional and modern kitchen styles. However, African Fusion is a softer material and will require more looking after. For full details please ask one of the sales team how to keep this material looking stunning for years to come. A very similar alternative to this granite would be Black Cosmic. 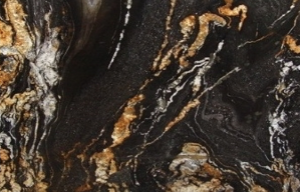 Please ask one of the sales team as to whether either African Fusion or Black Cosmic granite is in-stock to view. African Fusion is a Natural Quartzite from Brazil, Landford Stone offer this type of stone in a variety of thicknesses and finishes. African Fusion is a High priced stone and will look incredible in your home!